The following courses are being offered Spring 2018. All times are 5:30pm to 8pm. Please refer to Banner for more information. Have you ever wanted to create a 3D map, well WRLD has a free solution for you to use. 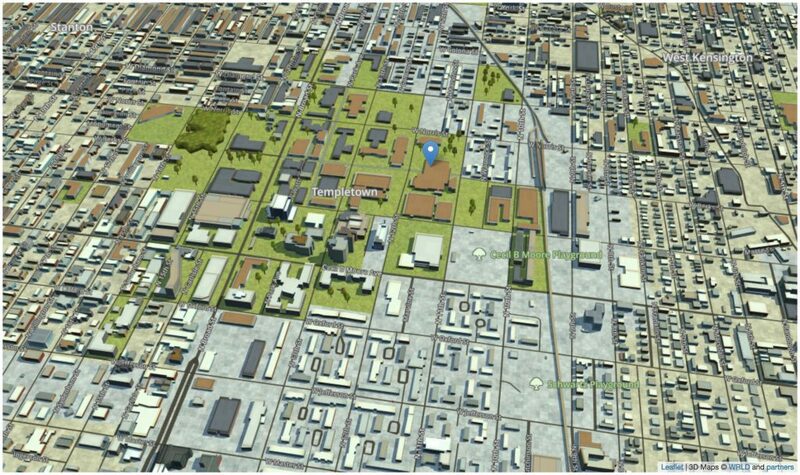 WRLD is a geospatial company that provides users the ability to create 3D maps through the use of their free API. WRLD uses reputable sources for their geospatial data including OpenStreetMap, USGS, NASA and more. 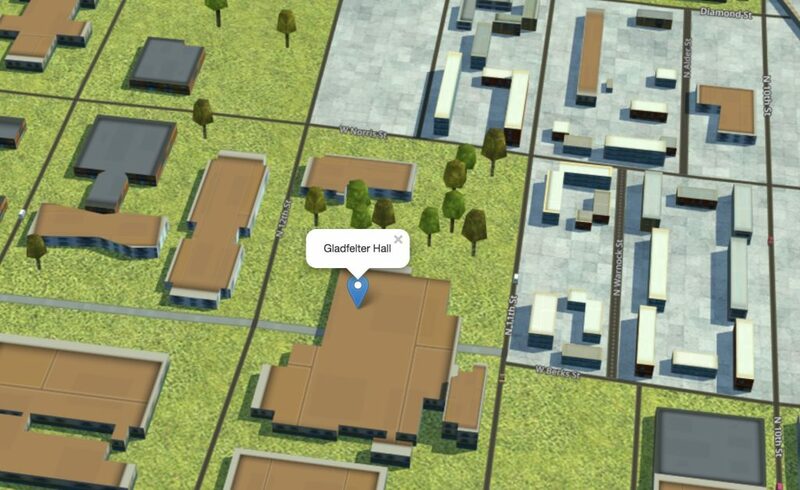 The first step towards creating 3D maps is to create a WRLD 3D account at https://www.wrld3d.com. Once your account has been created and verified, you will then need to create an API key which is located under your account information. Each user will have an unique API key that will be used by WRLD to track the amount of usage. The API key is free as long as you have less than 60,000 users / web views per month. //Location of marker. Latitude/Longitude can be found from Google Maps by right clicking and selecting what’s here? Make sure to save the file with the extension with .html within Brackets in order for it to work using your localhost. Once connected to the live preview (volt button on top right), the maps will be seen below. Also, you will be able to zoom in and out by “pinching.” 3D coverage is available throughout the world in major metropolitan areas and additional areas can be built for a fee from the WRLD company. How does the old saying go? Look to the past… something something… the future? Anyway. Sometimes when looking for solutions to spatial issues you have to look into the historic conditions that made those issues possible. In a digital world, the past is not always accessible in your desired working form. That’s why digitizing exists. In Arc Desktop, you can use the georeferencing toolbar to take any image and give it spatial relevance. 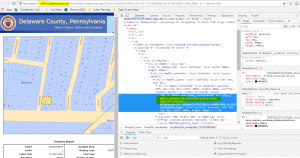 When bringing in image data, ArcMap will alert you that the data had no spatial reference. This is when the georeferencing toolbar will activate. When overlaid with a raster or shapefile of the same spatial area, you can add control points between the two to make the non-spatially referenced image line up with the spatially referenced map. Through a gradual game of point-and-click, we can move the non-referenced historic map image into place. During my Urban GIS class, I delved into the litter crisis ongoing in Philadelphia. Why has Philadelphia become so infested by plastic snack bags and street mattresses? I started sifting through the information I could find easily: Demographics, poverty, locations of public waste bins, etc. The distribution of high rates of litter throughout the city affected impoverished and minority groups the most. What I didn’t know was why. Once I introduced data on vacant an abandoned property into my analysis, I realized that the conditions which breed excessive litter may have something to do with the marginalization of specific neighborhoods and groups of people. Redlining historically restricted or eliminated any investment opportunities inside neighborhoods that were deemed “undesirable”. I’ll give you one guess to figure out what that meant. 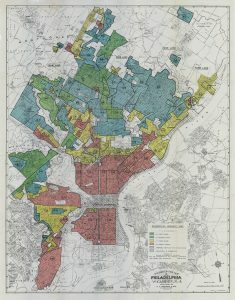 I wanted to know if a history of redlining in Philadelphia influenced the way litter is distributed throughout the city today. Upon failing to find a nice ready to use shapefile, I surrendered myself to the (then) scary world of digitizing. Here is the 1937 Home Owner’s Loan Corporation Map, also known as a redlining map. Areas marked in green were the most desirable, followed by blue, yellow indicated to be cautious with investment, and red referred to completely undesirable areas. Before the HOLC map was digitized, I could only do a visual inspection to see how the areas that I found to heavily littered compared with the areas of redlining. With digitization, I could do a real overlay analysis to see how these areas lined up. First I used georeferencing to align the HOLC map with a shapefile of Philadelphia. 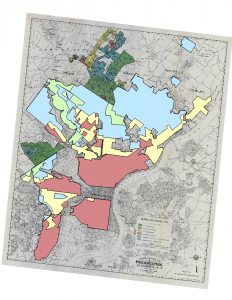 Once the HOLC map had its spatial reference, I created a new shapefile and used the editor toolbar to draw my own polygons around each of the designated desirability sections on the HOLC map (I saved myself some time by only drawing out the polygons that were inside Philadelphia county). In the attribute table I assigned a number for each of the desirability scores so I could distinguish each of the polygons and be able to use them against the demographic data I have acquired. What I found was that as the litter score in an area increased, the level of desirability according to the HOLC map decreased. My conclusion from this overlay was that litter could be symptom of a greater issue within a city – that of lack of investment. This is a conclusion I could not have come to had I not been able to access and manipulate historic maps, like the one seen here. Confession: I am terrible at keeping my own files. Really bad. Like a digital version of those houses you see on ‘Hoarders’. Yes, at work I can handle our naming systems and organizational structures, but navigating my personal computer is like navigating a maze. Its exhausting. As a result of this digital mess, I got into an unsustainable pattern of re-downloading files from the original internet source instead of finding the version I had already saved. You don’t want to know how many “2010_Census_Tracts_Phila.shp” are probably weighing my computer down right now. With that being said, here is how my poor computer is able to preserve its remaining disk space: Server connections and API links. Two terrible sounding phrases, no? No. They are not nearly as complicated as I once thought and I will prove it. 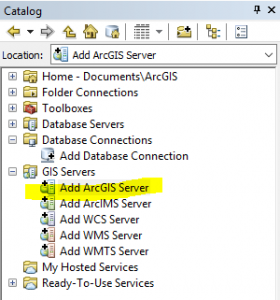 In ArcCatalog go over to GIS Servers and click the first option Add ArcGIS Server. 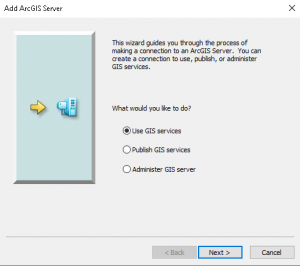 Then open the wizard and click Use GIS services. 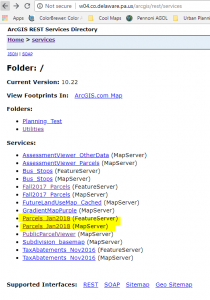 Copy the beginning of the link: “http://websitename.gov/ArcGIS/rest/services” and paste into your browser. And now you have basically any and all of the GIS data on the Internet! Ok, obviously not all of the GIS data on the Internet, but now you have the tools to access a lot of data that might have seemed inaccessible to you before. If anything, I hope these instructions help any other digital hoarders whose computers have suffered long enough. There may be times where you have a set of points (say from a GPS receiver) and need to create a path that connects them. There is a useful tool in the processing toolbox in QGIS that enables the connection of those points, allowing you to determine the drawing order points and the resulting path or polygon. This discussion starts with the assumption of some kind of geospatial point data in a CSV file. At the very least, the points should have an X and Y value that QGIS can interpret, and it is a good idea to have a field in the data that specifies the drawing order, since the resulting paths can vary widely for the same set of coordinates, although any numerical field can be used to set the order. Once your data is set up and imported into QGIS as a delimited text layer, pull up the “points to path” tool in the processing toolbox. The input layer and drawing order field need to be set, but there is also a field that allows for the grouping of features, which outputs individual line features per group as well as a field to enter a storage location for the resulting vector file. The examples below shows the output of this tool. 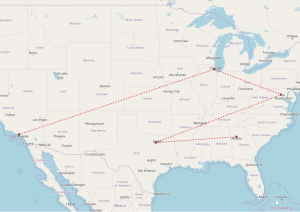 This is a set of five airports (Atlanta Hartfield-Jackson, Chicago O’Hare, Washington Dulles, Dallas-Fort Worth and Los Angeles International, in that order), connected by the resulting path based on a “drawing order” field in the data. By editing that field, I can get a different path result from the same data points, as shown in the second example. I chose this data in order to present this tool in a broad context, although it seems to be useful at much larger scales. It is worth noting that these paths are treated the same as any other vector paths in QGIS, that is, they can be styled and edited just like any other, including adding nodes and changing start and end points. They are not connected to the layer from which they were created, but are completely independent. They do not follow any network other than the drawing order, so there is limited use for this technique for determining distances over a large area, but it could be useful when looking at points arrayed in a small region. Another useful application of this tool might be in collecting handheld GPS data (from a simple device such as a phone) of corners of a piece of property and converting them into a polygon (with the aptly named “lines to polygons” tool, also in the processing toolbox). Points connected to each other by path, based on the drawing order in the data table for the point layer. Same set of points as before, but this time with a new drawing order in the data table. Any numerical field can be used to determine the order of connections. In 2017, I was an intern for the Borough of Emmaus, a small borough of roughly 11,000 people located in eastern Pennsylvania. While employed, I was tasked with creating a map of the entire borough that was required to show certain datasets and information. The information that was required included storm water pipes, water flow direction, outfalls, inlets, bodies of water, retention areas (present and proposed), manhole covers, and elevation contours. All of this information was required by a program being run by the State of Pennsylvania entitled the “MS4 program”. Creating of the program was done to comply with the federal clean water act, with the main goal being cleaning up the pollutants in our bodies of water. 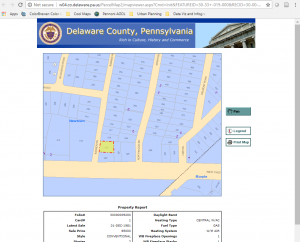 One of the main challenges I was working with regarding this project was that I was the only person employed by the Borough that knew how to work a GIS software, let alone know what GIS even is. This was an obstacle I did not think I was getting myself in to. Trying to explain the processes that were happening and needed to be completed to other borough employees was challenging. Another facet of this issue was that I didn’t have a single person to bounce ideas off of o anyone to ask a question to if I got stuck. For someone that never worked a job using GIS and still completing their bachelor’s degree, this was a massive learning curve. Another major problem I had to deal with was the borough didn’t have any type of GIS data readily available. Some datasets I had to download (like borough boundaries and aerial imagery), while others I had to manually create by myself. All of the storm water pipes were hand drawn onto paper maps by the water department and I had to spend quite a lot of time digitizing every pipe segment as well as inputting the attribute data associated with each segment. For one man to complete nearly one thousand pipe segments, this took some time. Once all of the leg work was completed and compiled onto a functioning map, it was then able to be submitted. 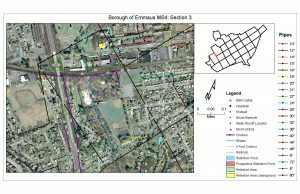 For the borough, since they did not have any GIS professionals on staff, they first sent the finished map to be revised by an engineering firm that specialized in this municipal storm water program. A few weeks later, they approved the map and it was submitted to the state department of environmental protection. As seen below, this map is only a subsection of the much larger map. Subsections were created to be able to get much better resolution of every storm water pipe and so the water department could carry these maps with ease. All in all this project and internship was a difficult task for me at the time and made me learn a lot about GIS and the GIS profession in a short amount of time. Just because a project may sound easy doesn’t necessarily mean it will be just that. A lot of times there are various issues and problems that are encountered which increase the difficulty of the project. 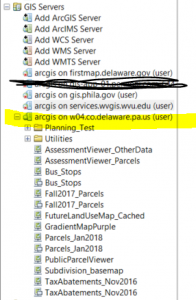 It is important to learn and adapt to every project that comes in front of a GIS user, and I learned doing this will make you a much better GIS professional in the future. You know that feeling when you answer the “what are you studying” question of and receive a blank stare? Geographic Information Systems is often thought of as a niche discipline but I’ve found it applicable to more situations the further I get into my program. At the moment, I am a part of the gig economy, making pour over coffees with in a small family owned café in South Philadelphia. One morning, my coworker Brendan asked me what I was planning on doing with the second half of my day (the morning shift goes from 6:30 to 1:30). At the time I was in week 4 of the 6 week lightning speed Advanced Statistics for Spatial Analysis. If you have not yet taken this course yet, it’s a whirlwind of mathematics and coding that will dominate your brains’ bandwidth. In week four, the topic being covered is Geographically Weighted Regression, or GWR, which is a form of linear regression with so much computation needed that in order to solve an equation by hand it would likely take you all six weeks of the class just to f. So, most of the algebra is performed in the programming language R, and you are left to understand the principles of GWR by reviewing every piece of literature you can get your hands on. A key concept in understanding geographically weighted regression is the notion of complete spatial randomness, or CSR. CSR can be equated to the null hypothesis as it is understood in regression. It assumes that there is no pattern in the data, and therefore predicting values at the mean is a more accurate way of building a model to describe attribute values. Brendan seemed interested in my answer to the question of the ‘what are you studying’ question when I described GIS as a sort of amalgamation of cartography, data science, and spatial analysis, and followed up with a question concerning what sort of topics the class was studying. Describing the concepts of GWR and CSR to a novice can be overwhelming or simply tedious if it’s not somewhat applicable to how you see the world. This is a skill I still very much have to develop and look forward to doing, and at the time I thought I would give it a try. The barista life is a messy one. Behind the counter we tuck towels into every nook and cranny in order to be ready for the inevitable coffee leaks, bean spills, and failures in the equipment used to serve up your favorite beverage. Taking a towel and placing it neatly onto the counter, all edges flattened, I created a plane in which to serve as the example of testing CSR. I grabbed a handful of coffee beans and threw them onto the towel, creating a nice contract of brown data points upon a white surface. What do we observe by examining the distribution of coffee beans on the towel? If the fact that some beans tend to cluster towards the middle would this be sufficient enough data to say for certain that some attribute embedded within the beans causes them to cluster? Does location of data points play a role in its’ distribution? What’s with these coffee beans? In order to do this we would need to test the theory by running the test many times- as is done in a Monte Carlo simulation which makes a distribution of the results of your regression output as many times as the user pleases. Brendan and I just did the test the one time but if we were to waste a morning seeing whether or not the beans clustered or dispersed we would indeed be able to say with a high degree of confidence how our observations related in space. The Lehigh Valley in east-central Pennsylvania contains the Lehigh River and is a west-east trending lowland bounded to the north by Blue Mountain and to the south by South Mountain. Allentown, Bethlehem and Easton (ABE) are the three largest cities and together make up the ABE metropolitan area that is bounded to the east by the Delaware River, defining the border with New Jersey. This area became a metropolitan hub because of its close proximity to the anthracite coal region to the north and the natural waterways used for industrial supply and transportation of coal and goods to the larger New York and Philadelphia metropolitan regions. As during the industrial revolution, this growth is supported by ABE’s optimal geographic setting, the availability of affordable open land and the improving transportation infrastructure. These factors set the stage for a post-industrial era expansion as a regional bedroom community and diverse industry base. This spatial analysis was conducted to quantitatively evaluate the changing post-industrial era land use during the last 30 years (1987 to 2017). In this 30 year period, combined urban land use change(high and low density) increased at 217.40 km2 while combined agriculture land use (including bare soil) decreased by 192.56 km2. In other words, this area has increased in infrastructure and urbanization nearly as much as it’s lost its agricultural land use. “Forging America: The History of Bethlehem Steel – Chapter 2.”mcall.com, 12 July 2008,www.mcall.com/all-bethsteel-c2p2-story.html.